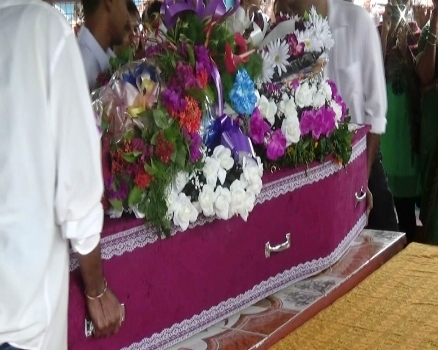 Tanvi and Jeralle Prasad who were killed by their father in Kinoya, Nasinu were accorded their final rites today. They were cremated at the Nasinu Crematorium with their father Johiteshwar Prasad. Pranish Deo Lal, an uncle of the two deceased children says the entire family has not been able to cope with the loss of lives. ‘’Friday afternoon around five-thirty to six, in between that, when he spoke to me and he told me to go and visit them at their place, after that I didn’t meet him, but he was very happy from then, they didn’t have any arguments or anything in front of us. They were a very happy living family. The last dinner I had was on Thursday night with them, so after that, I haven’t seen my sister, and the kids are really close to me, I really miss them’’. A large crowd turned up to pay their last respects to the deceased. The three were found dead in their Kinoya home last Saturday. The children’s mother is in critical condition at the Colonial War Memorial Hospital in Suva. FBC News understands Prasad attacked his wife, killed his two children and then took his own life.